The May Queen; Margaret Macdonald Mackintosh; Gesso Panels, Ingram Street Tearooms. Photo by Mike Thomson. Margaret MacDonald Mackintosh (1864-1933), was a Scottish artist who worked in gesso, textiles, and metals. She and her sister Frances MacDonald enrolled at The Glasgow School of Art at the turn of the 20th century, and some of the first women allowed to attend classes. Later, the sisters left school to start their own studio together. Margaret MacDonald was introduced to Rennie Mackintosh, an architectural student, by the head of the Glasgow School, and Frances to Rennie’s associate, Herbert MacNair. After each pair married, they were known as the Glasgow Four. 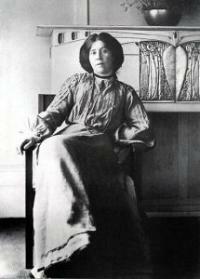 Margaret MacDonald Mackintosh. Opera of the Sea. 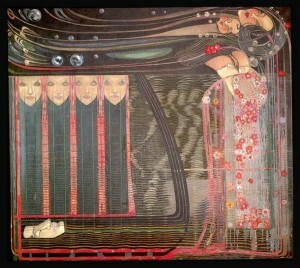 Margaret MacDonald was the first Margaret to inspire me to do a Margaret’s Board on Pinterest. She also shows up in my Dynamic Duos board. The more Stratoz and I collaborate in our art, the more curious I get about other artistic and creative partnerships. Have you ever been inspired by another person in your own creativity? Known any Dynamic Duos? I love her work! I had not heard of her before reading your post, but she’s awesome. Thanks. What a great marriage of creativity and mutual respect. Something to be admired.